A blue barn with a “Thank You Farmers” message near Beaver Dam was the first of four such barns to be adorned with the message by Culver’s. Gary Gullicksrud, one of the owners of Hamlin Valley Farms near Eleva, said roof collapses on his family’s farm have made it difficult to find housing for the farm’s cattle. The roofs of four buildings at Hamlin Valley Farms in Trempealeau County collapsed during the Feb. 23-24 round of winter storms. Workers cleared snow from the roof of a barn Tuesday, Feb. 26, at Hamlin Valley Farm east of Eleva. Heavy snows and winds caused the collapse of roofs of four barns at that farm and at many others across west-central Wisconsin in recent days. Workers shoveled snow last week from what remained of a barn roof at Friendshuh Farms near Clear Lake in southern Polk County. More than 30 head of dairy cattle were killed after another section of roof on the barn collapsed late last month due to heavy snow load. ELEVA — Even as another round of snow was beginning to fall, employees, contractors, an insurance adjuster and a veterinarian scrambled around Hamlin Valley Farms surveying the damage after a winter storm Feb. 23-24 caused the roofs of four buildings on the farm to collapse, killing at least 40 head of Holsteins and injuring another 30. Gullicksrud said roofs started collapsing early Sunday morning, when one of the main milking barns went down. After a connecting link used to bring cows to the parlor collapsed, panels on the roof of the 1,000-cow barn started collapsing. “Shortly after it started, it was a domino effect, and every barn was collapsing,” Gullicksrud said. “Luckily, nobody got hurt, but we weren’t able to get all the animals moved away quick enough. Gullicksrud said the loss of animals could have been worse if it wasn’t for the efforts of the farm’s employees, who heard the roof cracking and were able to clear out some of the pens. They then called Gullicksrud, who made his way back to the farm at 2:30 a.m. Sunday. Gullicksrud said the farm shipped their heifers to an area grower for the time being and consolidated the milkers. He said the family felt fortunate their parlor was undamaged. Gullicksrud said most of the farm’s buildings are 110 to 120 feet wide and 30 to 40 feet tall. One of the damaged barns was constructed in 1993, and the others were added in 1997. Hamlin Valley Farms was founded in 1986 by brothers Gary, David, Mark and Eric Gullicksrud. Gary’s son Chad and David’s sons Jordan and Justin have since bought into the farm. The farm milks about 2,100 black-and-white Holsteins three times a day in a double-30 parallel parlor. Gullicksrud said several area businesses volunteered to help with clean-up, and several workers were using backhoes with scrapers in an attempt to clear snow off some of the farm’s undamaged roofs. UW-Extension agriculture agents in western Wisconsin had heard reports of several roof collapses, with Mark Hagedorn in Eau Claire County reporting eight to 10 in his county alone, and Jerry Clark said he was aware of another four in Chippewa County. Trempealeau County UW-Extension Agriculture Educator Steve Okonek said he’s heard reports of everything from mink sheds near Independence to smaller lean-tos collapsing in his area. Randy and Char Glenna are going through the first full winter with their new dairy barn near Amery in Polk County. Char said hearing of recent barn roof collapses has her on edge. “I look at our barn roof every day in fear, not knowing how much is too much or even what’s there,” she said. 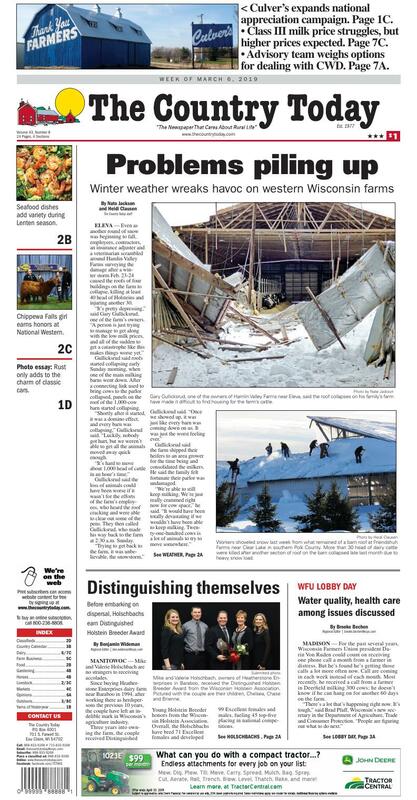 Across the border, more than 15 barn roof collapses were reported in southern Minnesota, displacing many dairy herds. Ellsworth Cooperative Creamery reported damage to its popular cheese curd trailer after the roof of the shed in which it’s stored for the winter caved in. Paul Fischer milks 75 cows in the Owen area and ships about 5,000 pounds of milk each day. Normally, milk from his farm is picked up daily, but because the milk truck couldn’t get through to the farm due to treacherous, drifted roads, the Fischers were forced to send 1,000 pounds down the drain after the Feb. 24 evening milking to make room in the tank for the next morning’s milking. Fischer said he knows of several other local farmers who had to dump milk — one as much as 5,000 pounds — during the storm because drifting snow made the roads impassable and milk trucks couldn’t make it to their farms. One smaller farmer stored excess milk in pails. Across southern Minnesota, hundreds more dairy farmers had to dump milk Feb. 24-25 after milk tankers failed to reach their destinations for timely pickup. The Fischer farm is located on a town road about two miles off a county road. Fischer said that even from the driver’s seat of his four-wheel-drive Dodge pickup, he could barely see over the snowbanks last week. He said he knows of several collapsed barn roofs in Clark and Taylor counties and recently had someone come in to shovel off two of his roofs because he was concerned about snow load. With more snow forecast last week and temperatures remaining well below freezing, he said, more snow removal could be necessary later. Fischer said his farm received more than 4 feet of snow last month, and with the ground freezing so deeply earlier in the season, he fears that much of this snow will run off in the fields. The recent heavy snowfall provides good reason to be concerned about heavy snow loads on farm buildings, especially if more snow falls before the snow already there melts or slides off. In addition to estimating the roof loading, he said, it’s important to know the loading the roof can resist. Okonek recommended farmers who were planning to get up on roofs to remove snow first remove the equivalent of their body weight in snow before climbing onto the roof. Wisconsin Farm Bureau President and Rural Mutual Insurance Company President Jim Holte said recent weather only added insult to injury for western Wisconsin farmers already struggling through tough market conditions. He asked for continued prayers for these producers. “As farmers were already handling the severe wind and snow, building collapses added even more stress and hardship,” he said. Holte said Rural Mutual Insurance is setting up and assigning claims to adjusters as they are submitted by insured farmers. Rural Mutual adjusters will be in touch within 24 hours of a farmer submitting a claim and will set up a time to come view the damage. Farmers are encouraged to submit claims as soon as possible and be specific about the location and extent of the damage. “I ask you keep our farmers in your thoughts and prayers as they dig out and continue caring for their families, farms and livestock to the best of their ability,” he said. Okonek recommended farmers with building, livestock or feed losses contact their local U.S. Department of Agriculture Farm Service Agency office because FSA officials are compiling information for a disaster declaration. Mike and Valerie Holschbach, owners of Heatherstone Enterprises in Baraboo, received the Distinguished Holstein Breeder Award from the Wisconsin Holstein Association. Pictured with the couple are their children, Chelsea, Chase and Brienne. MANITOWOC — Mike and Valerie Holschbach are no strangers to receiving accolades. Since buying Heatherstone Enterprises dairy farm near Baraboo in 1994, after working there as herdspersons the previous 10 years, the couple have left an indelible mark in Wisconsin’s agriculture industry. Three years into owning the farm, the couple received Distinguished Young Holstein Breeder honors from the Wisconsin Holstein Association. Overall, the Holschbachs have bred 71 Excellent females and developed 99 Excellent females and males, fueling 45 top-five placing in national competitions. Those achievements, along with numerous other memorable moments and contributions to the industry, earned the couple the Distinguished Holstein Breeder Award at the Wisconsin Holstein Association 2019 Adult Convention here in the Manitowoc County city of Manitowoc. In a way, the Holschbachs are going out on top. On April 13, Heatherstone Enterprises will host a complete dispersal of its herd starting at 10 a.m. at S5455 State Road 136, west of Baraboo in Sauk County. Mike and Valerie said they haven’t finalized plans for the future, but they’re looking forward to spending time with their grandchildren and embracing whatever lies ahead. That will be a significant change for the Holschbachs, who have been dairy farming practically since they were born. Both were raised on purebred Holstein farms and established themselves as pillars in the agricultural community. Mike grew up at Lakeside Farms in Sheboygan County and was named Wisconsin Outstanding Holstein Boy in 1978. Valerie grew up at Heatherstone and was crowned Wisconsin’s Fairest of the Fair in 1979. They married in 1981 and both began working as herdspersons at Heatherstone in 1984. In 1994 they bought the farm and steadily began modernizing the operation. They acquired a TMR (total mixed ration) mixer and calf hutches, set the dairy barn up for tunnel ventilation, constructed a new silo for corn silage and remodeled barn stalls, among other things. Valerie has overseen raising the calves and ensuring the upkeep of the attractive property, which draws attention from people traveling through Sauk County. Meanwhile, Mike has managed herd health and breeding decisions. Their breeding philosophy is simple yet highly effective: “We wanted to breed something we enjoyed milking and other people were interested in purchasing,” Mike said. The couple are quick to point out they couldn’t have been successful without assistance from others. Their three children — Brienne, Chase and Chelsea — helped on the farm while growing up. Chase has continued to play an integral role in daily farm operations and will be transitioning to another agriculture-based occupation after the dispersal, Mike said. Their strong support network reaches beyond family. The Holschbachs hosted and helped organize the inaugural Sauk County Dairy Breakfast, and they also hosted the 2008 National Convention Sale. Mike has judged Holsteins in multiple countries and coached the Sauk County 4-H Dairy Judging Team for 11 years, helping it win two state championships. He also served on the World Dairy Expo board of directors for 17 years, including seven years as president. Mike said the hard-working people he and Valerie worked alongside in their younger years laid the foundation for dedication on their part over the ensuing decades. Mike offered a few words of wisdom to young farmers navigating their way through the challenges of the dairy industry these days. “Develop a plan for your future and do as much as you can to stick with it,” he said. “Utilize professionals who can help you along the way — whether they’re lenders or nutritional consultants or whoever they may be. It’s a difficult business and you can’t do everything by yourself. Surround yourself with as many good people as you can. Wisconsin Farmers Union members climbed the stairs to the State Capitol on Feb. 27 to meet with their legislators and discuss a number of important issues affecting farmers today. Wisconsin Farmers Union President Darin Von Ruden provided opening remarks about the importance of activism at the organization's Farm and Rural Lobby Day on Feb. 27. Before meeting with legislators throughout the state, Wisconsin Farmers Union members gathered for their annual tradition of posing for a photograph in front of the “Forward” statue at the Wisconsin Capitol. MADISON — For the past several years, Wisconsin Farmers Union president Darin Von Ruden could count on receiving one phone call a month from a farmer in distress. But he’s found he’s getting those calls a lot more often now. Call are coming in each week instead of each month. Most recently, he received a call from a farmer in Deerfield milking 300 cows; he doesn’t know if he can hang on for another 60 days on the farm. It’s the fifth year of low commodity prices across the board, with Pfaff and Von Ruden encouraging farmers at the Wisconsin Farmers Union’s Farm and Rural Lobby Day on Feb. 27 to tell their stories to legislators, share how issues are impacting them and get involved at the state level. There were four main issues that Wisconsin Farmers Union members were asked to discuss with state legislators during lobby day, which saw about 50 people from all parts of the state attend, even with snowy weather forcing some to stay home. These issues were decided on as they were special orders of business passed at their recent convention. For the past six years, Rep. Katrina Shankland has been talking about water quality, and to her dismay, felt like no one at the state level really cared. However, she said the disconnect between the Capitol and the community is now becoming less and less, and she is even more excited that Wisconsin’s new administration is now making groundwater quality a priority. An estimated 1.8 million Wisconsin residents — more than 30 percent of the state’s population — relies on well water as their primary drinking water source. Unfortunately, a quarter to a half of those wells do not meet safe drinking water standards due to excess bacteria or nitrates, as shown in Kewaunee County and in southwest Wisconsin, where a recent study revealed 42 percent of wells tested positive for nitrates. In Portage County, her home county, one in four wells have tested positive for nitrates. “We’ve got a real problem,” she said. In early February, Shankland was named vice chairwoman of the Speaker’s Task Force on Water Quality, a 16-member bipartisan committee that will travel the state investigating groundwater and surface water contamination, listening to stakeholder concerns and eventually making recommendations on assessing and improving the quality of groundwater and surface water in Wisconsin. In her role as vice chairwoman, she plans to listen to the people, collect the data, publish a report to illustrate the issue and act, finding a policy solution that works into the future. She has also introduced a private well testing and compensation bill that would create a fund to make private well testing more affordable, increase the number of households eligible to participate in the already established Well Compensation Grant Program for contaminated wells and allow well owners to seek compensation from the fund for wells contaminated with nitrates, even if the well is not used for livestock. Shankland aims to boost efforts statewide to better understand water, commenting that water quality is both “an education and awareness issue.” She not only wants to make sure residents can remediate their contaminated wells, but also to assure that each household in Wisconsin doesn’t have to worry about a contaminated well down the road. She’s pleased with Evers’ proposed $70 million bonding measure to fund clean water initiatives through the Department of Natural Resources and DATCP and the approximately $30 million allocation for pollution cleanup, but she cautioned that just because these items are in the budget does not mean they will pass. “We need you,” she said. She encouraged Farmers Union members to ask their legislators to support Evers’ clean water initiatives, even if those legislators plan to back a competing budget. “I can’t think of anything more important to the health of those in our state,” she said. Health care is something that affects every single person in the state, but Kevin Kane of Citizen Action of Wisconsin argues that Wisconsin isn’t nearly where it should be when it comes to affordable health care. In fact, Wisconsin is one of the top five most expensive places in the country for health care, and for farmers, among others who are self-employed, the cost is a significant roadblock. Even with the passage of the Affordable Care Act, many farmers and rural residents struggle with high premiums, copays and deductibles, among other issues. Kane used the example of Brown County, where there is only one choice for health insurance through the Marketplace. It’s why his organization has been working hard to encourage legislators to accept federal Medicaid expansion funds and create a public option for BadgerCare, a health insurance program that 700,000 Wisconsin residents currently use. A 2014 referendum in which voters from 19 counties and the City of Kenosha were asked to vote on whether to accept the federal Medicaid funds gathered an approval of 73 percent. “We have the chance to demand something we know the public wants,” Kane said. As for BadgerCare, which is currently available to lower-income citizens of Wisconsin, he argues that if made available for the general public, could provide significant cost savings for both the state and those currently buying private health insurance. According to Kane, it could also break up the monopoly of private health care companies and hold the industry accountable. “Wisconsin could start leading the way again in health care,” he said. The Wisconsin Farmers Union also supports federal single-payer health care, and imagines the public option for BadgerCare would look very similar to a single-payer system, but at the state level. To Rob Richard, formerly of the Wisconsin Farm Bureau Federation, industrial hemp is “an issue that crosses the entire spectrum,” drawing bipartisan support from Republicans and Democrats alike. In fact, it’s been a pleasant surprise to him to see who’s willing to work on legislation around industrial hemp, especially after the 2018 Farm Bill legalized the once-prohibited crop. It’s no secret that Wisconsin has a storied history when it comes to industrial hemp production, but times are changing, and there is a new focus on high tech, with endless possibilities for hemp products such as batteries, interiors and exteriors of vehicles, home construction, personal care products and more. It’s sustainable and grown annually, and with the passage of Act 100 last session, is going mainstream. While significant changes to industrial hemp were found in the farm bill, the biggest “game changer” was the removal of hemp from the Controlled Substances Act. It has allowed Sen. Patrick Testin, author of Act 100, and Rep. Tony Kurtz to continue to work with stakeholders from agriculture, industry, law enforcement and the financial sector to craft legislation they’ve dubbed Hemp 2.0, which Richard called “a good, bipartisan bill” that he predicts will receive wide support. Several tweaks to Hemp 2.0 include an option to opt out of DATCP’s confidentiality clause, small changes to definitions to conform to farm bill definitions and the exploration of DATCP using third party testing as interest increases in industrial hemp. While Richard appreciates the enthusiasm of Testin and Kurtz, he hopes other legislators will show more energy and get more excited about the possibilities when it comes to industrial hemp in Wisconsin. The state budget is front and center for legislators at the moment and is an articulation of the priorities we have as a state, said Kara O’Connor, Wisconsin Farmers Union government relations director. She asked Farmers Union members to select one or two issues that affect them personally and share how those issues impact them, as well as build a relationship with their elected officials and extend a future invitation to events such as farm tours and pasture walks. Wisconsin Farmers Union supports a number of provisions in the proposed 2019-21 budget, including but not limited to: funding the Farm to School competitive grant program at $350,000 per year; increasing funding for the Buy Local, Buy Wisconsin program; restoring the Grazing Lands Conservation Initiative; increasing funding that will benefit rural schools such as sparsity and transportation aid; funding for UW Veterinary School expansion; a drastic increase in funding for well testing and remediation; an increase in funding for broadband expansion grants; and additional funding for another full-time employee dedicated to antitrust enforcement at the state level. “It’s our job as citizens to put the pressure on and put them in the hot seat,” said Sarah Lloyd, Wisconsin Farmers Union director of special projects. “Lots of work is being done today by just being here in person and giving a face to these issues,” added Bobbi Wilson, Wisconsin Farmers Union government relations associate. Jana Swansen of Chippewa Falls, second from right, was named National Western Stock Show Reserve Champion Junior Showman in January at the 113th National Western Stock Show in Denver. Jana is pictured with Gary Krumenauer, her grandfather and owner of Summit Ranch, and Ian McNaughton and his daughter, Kaleigh, of Ontario, Canada, who bought the heifer.